Shaw Conference Centre, a diagonal elevator to access the lower conference halls from Jasper Avenue. Quebec City, Old Quebec Funicular (1879-1907) cable, (1907-1945) electric, rebuilt in 1946, in operation to this day. Artillería Elevator on Artillería hill, Valparaíso. Guanajuato City, Guanajuato funicular : inaugurated in 2001, it joins the theatre Juarez to the monument El Pipila. 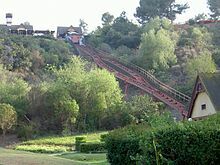 The Industry Hills Golf Club funicular in the City of Industry, California. Feather River Canyon, Bucks Creek Powerhouse, single car incline used for inspection of water system, now abandoned. Rails still visible on canyon walls. Court Flight (closed),(operated from 1904-1943 damaged by fire; razed 1944), now site of Court of Flags. Mt. Washington Railway (opened 1909, closed 1919), Operated in the Highland Park/Mt. Washington neighborhood of L.A., ticket office and powerhouse still exist. Playa del Rey (1901-1909) Two cars ran in a counterbalance configuration from a Los Angeles Pacific Railway stop at the base of the Westchester cliffs to a hotel at the top of the bluff. Legend has it that the two cars were named 'Alphonse' and 'Gaston'. San Francisco, The "Las Casitas Tram", a private funicular used to serve an apartment complex on Bay Street. Ridge Hill Incline, Yonkers other funicular to the Sprain Ridge Hospital Campus. Fontana Dam turbine hall access on the east side of the Little Tennessee River (a single car with a balance sled which rolls on tracks underneath the cab). No longer operational. Joginder Nagar, Himachal Pradesh is India's highest funicular at 2500 metres. It was built in 1930s to carry heavy machinery of Shanan Power House to Barot.It is on one meter gauge. Bhira and Bhivpuri Road in the state of Maharashtra, the Tata Group operates funicular railways. Saptashrungi, Maharashtra, expected to open by late 2016. The country of Turkey is in both Europe and Asia. The border between the two continents is the Bosphorus Strait. All the funicular railways in Turkey are on the European side of the Bosphorus Strait so they are listed under Europe. ^ "Monte Serrat". turismosantos.com.br. Archived from the original on 6 February 2018. Retrieved 6 February 2018. ^ Cummings, Madeleine (2 November 2016). "Crews prepare to install cab from Switzerland as construction on river valley funicular project continues". Edmonton Examiner. Retrieved 3 November 2016. ^ "Edmonton launches $24-million river valley funicular". CBC News. Retrieved 9 December 2017. ^ "Valparaiso". Funiculars.net. Archived from the original on September 30, 2011. Retrieved June 14, 2007. ^ "Grutas de Garcia". floatplans.com. Retrieved 2011-02-21. ^ "Puerto Rican Funicular". prvacationhelpers.com. Retrieved 8 January 2018. 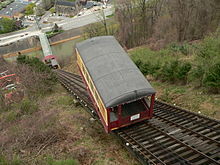 ^ "Fairfax Incline Railroad Installed". ^ "Playa Del Rey Incline". erha.org. Retrieved 2016-06-24. ^ "2-bedroom Las Casitas Spanish Revival served by a funicular". 5 February 2014. Retrieved 21 August 2015. ^ "Trail's End - Inclines and Funicular Railways in Colorado - Colorado Gambler". 2014-09-03. Retrieved 2016-06-28. ^ "New Funicular in the Yellow Mountains (Huangshan)". Funimag. January 3, 2014. ^ "China's earliest funicular railway to resume". www.cqnews.net. 2015-01-07. Retrieved 2018-01-09. ^ 杜漩. "朝天门缆车今年原址复建 乘客上下游船更方便". Retrieved 2018-04-14. ^ "Sandiequan, Lu Shan, China". Gangloff Switzerland. Retrieved 2011-10-27. ^ "choochoopark, Incline Train". Choochoopark official website. Retrieved 2017-03-09. ^ "Palani Temple". Funiculars.net. Retrieved April 4, 2007. ^ "Wat Phra That Doi Suthep - Chiang Mai - Thailand". Sacred Destinations. Retrieved 2013-09-06. ^ "Funicular". Ba Na Hills. Retrieved 2016-08-30. ^ "About Sights - Tibilisi Funicular". Georgia About. Retrieved 2013-09-06. ^ "Diana Tower". karlovy-vary.cz. Retrieved 2013-09-06. ^ a b "History of the Hotel Imperial". Hotel Imperial. Retrieved 2013-09-06. ^ "Standseilbahn Hohenwarte". 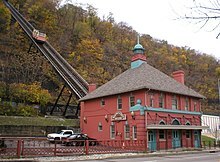 funiculars.net. Archived from the original on 6 February 2018. Retrieved 6 February 2018. ^ Eisenbahnatlas Deutschland. Verlag Schweers + Wall GmbH. 2009. p. 87. ISBN 978-3-89494-139-0. ^ Cacozza, Marco (April 2016). "San Pellegrino Terme funicular to reopen". Today's Railways Europe (244). Platform 5 Publishing Ltd. p. 18. ^ "Infrastructure ferroviaire Projets 2015 – 2024 Exemple: Funiculaire Arrêt Kirchberg - Pfaffenthal" [Rail Infrastructure Projects 2015 - 2024 Example: Funicular Stop Kirchberg - Pfaffenthal] (PDF). www.mobiliteit.lu (in French). 18 September 2015. Retrieved 8 January 2018. ^ Анжела Аджар (2015-09-14). "Первый современный фуникулёр в России за 15 лет открыли в Сочи" (in Russian). Retrieved 2016-09-19. ^ "LTB - Ligerz Tessenberg Bahn". Funimag. Retrieved 2011-10-12. ^ "Vinifuni". aare seeland mobil. Retrieved 2014-03-04. ^ "SMtS - Saint Imier - Mont Soleil". Funimag. Retrieved 2011-10-12. ^ "NStP - Fribourg / Neuveville-Saint Pierre". Funimag. Retrieved 2011-10-12. ^ a b c "Funiculars of Switzerland". Funimag. Retrieved 2011-10-12. ^ "DSB Davos - Schatzalp". Funimag. Retrieved 2011-10-12. ^ "MMB - Muottas Muragl Bahn". Funimag. Retrieved 2011-10-12. ^ "DBB - Dietschiberg Bahn". Funimag. Retrieved 2011-10-12. ^ "TN Ecluse - Plan". Funimag. Retrieved 2011-10-13. ^ "La Coudre - Chaumont". Funimag. Retrieved 2011-10-13. ^ "SthB - Stanserhorn Bahn". Funimag. Retrieved 2011-10-12. ^ "FüB - Fürigen Bahn". Funimag. Retrieved 2011-10-12. ^ "Drahtseilbahn Unterwasser - Iltios". Funimag. Retrieved 2011-10-12. ^ "Funiculaire Châtelard - Château d'Eau". Funimag. Retrieved 2011-10-13. ^ "Minifunic d'Emosson". Funimag. Retrieved 2011-10-13. ^ Felix Gross (2011). Seilbahnlexikon: Technik, Relikte und Pioniere aus 150 Jahren Seilbahngeschichte (p. 51). ^ "FLT - Saint-Luc Tignousa". Funimag. Retrieved 2011-10-12. ^ "SMC - Sierre - Montana - Crans". Funimag. Retrieved 2011-10-13. ^ "ZSB - Zermatt - Sunnegga Berg". Funimag. Retrieved 2011-10-13. ^ Trimingham, Adam (8 March 2014). "Dyke Steep Grade Railway". The Argus. Newsquest Media (Southern) Ltd. Retrieved 10 October 2018. ^ "Folkestone Leas Cliff Water Lift". Retrieved June 14, 2007. ^ Hows, Mark. "London Millennium Funicular". Retrieved 6 November 2012. ^ "URBIS Museum Manchester". Funicular Railways of the UK. Retrieved 2013-09-06. ^ "Sennen Cove". Funicular Railways of the UK. Retrieved 2013-09-06. ^ "Southend Cliff Railway". Retrieved June 14, 2007. ^ "National Coal Mining Museum". Funicular Railways of the UK. Retrieved 2013-09-06. ^ "Legoland Hill Train". Funiculars.net. Retrieved April 4, 2007. ^ "Legoland Hill Train (formerly Windsor Safari Park railway)". Dr Mark Hows. Retrieved June 16, 2007. ^ a b Woodhams, John (1989). Funicular Railways. Shire Publications. p. 21. ISBN 0-7478-0040-5. ^ "Port Soderick, Isle of Man". 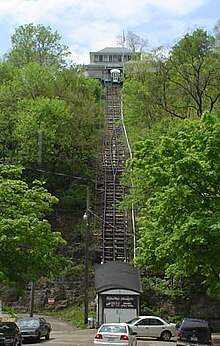 Funiculars.net. Retrieved April 4, 2007. This page was last edited on 1 April 2019, at 17:04 (UTC).